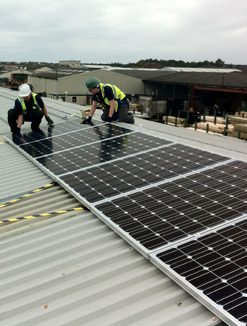 Commercial solar installations help business deliver real financial savings in the workplace – cutting electricity bills as well as providing feed-in tariff income over 20 years. We’ve installed commercial solar power in a variety of settings, helping our clients make the most of otherwise unused roof space. Office buildings often have large tracts of unused, unappreciated roof space. We see this space as an unmissable opportunity. Commercial buildings often provide easy access to install substantial arrays of solar PV panels for generating electricity. Under the feed-in tariff, your business gets paid for every single watt of electricity you produce – whether you use it all yourself or export it to the grid. Index linked for 20 years – there has never been a better time to embrace efficiency. The results of our installations are real business savings: reduced electricity bills from solar pv as well as feed-in tariff income from the energy you generate. The application of renewable energy systems to business today are seen to be a real asset, the cost of which can often be off-set against taxable profits as capital expenditure. It provides protection against rising electricity costs and demonstrates your green credentials by lowering your business carbon footprint.